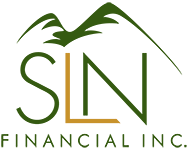 November 22, 2017 - Money Tips for your Children and Grandchildren | SLN Financial, Inc.
Financial literacy in America is staggeringly low. The U.S. ranks 14th on a global scale of financial literacy, and 1 in 5 teenagers do not have basic financial skills. Helping our younger loved ones to understand the responsibilities and skills behind their money has grown increasingly important. If you have children or grandchildren, you can play an important role by encouraging them to develop disciplined, forward-looking money habits. Engage them in financial topics. As the top influencer in your children’s financial lives, it’s important to talk about money early on. According to a Cambridge study, children form their money habits by 7 years old. Yet, many families are not having the conversations they should to foster these skills‐even with their adult children. You can engage younger children in simple ways like letting them help you count change at the register. For older kids, have your 13-year-old set a long-term goal that requires them to plan their money. Ask college-bound kids to actively help you compare tuition prices and discuss feasible options. No matter your child or grandchild’s age, you can help them grow into adults who are financially responsible. And it starts by including them in financial conversations and experiences. An adult’s ability to independently manage money depends greatly on what they learned about cash flow early on. But, despite being one of the best ways to manage finances, 59% of Americans do not use a budget. Before teaching children to budget, make sure that you also responsibly meet this goal. Working with your children or grandchildren to understand budgeting will help them know how to track their spending and saving‐and the relationship between our decisions. Of course, different age groups will need to learn budgeting in different ways, but introducing them to the concept helps put them on the right path. Title them individually, "Save," "Share," "Spend." Have your child them split any allowance or cash gifts between the 3 jars (with 10% going to the "Share" jar to develop awareness of charitable giving). The better habits you engrain in your children and grandchildren now, the more likely they are to continue them without your support. If you would like to discuss the overall financial literacy of your family and ways we can help you engage them in conversations, we are happy to help.